M4 Rifle never gets bored! There is no denying that AR-15 or M4 Rifle is one of the most popular Airsoft rifles used by Airsoft players. You won’t be surprise how many players are carrying it on the field. Even though there are hundred of variant M4 models selling in the market, in 2016, APS created three beautifulM4 Rifle that will definitely attract your eye sight. 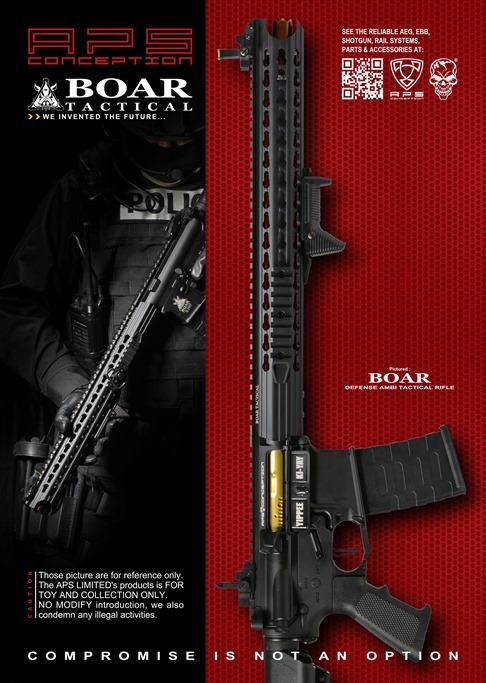 You can tell by its name “Boar Tactical”. What’s the advance feature of this rifle? 1) Standard comes with 16” RIS KeyMod Hand Guard. 2) Dynamic Hand Stop Grip. 3) Quick Detach Sling Buckle. With the long barrel and Silver Edge Gear Box used in our ASR117, accuracy is significantly improved. ASR117 can be used an assault rifle, or somehow used as a sniper rifle because its accuracy and range. Further developed from ASR117, we have created an 3 Gun version named ASR118. ASR119 – 3 Gun Custom (Special Mode) – Hot Red Rifle! The most attractive M4 Rifle that is designed for shooting. Same as its brother ASR117 and ASR118, it has 16” Keymod RIS, 8mm full bearing Silver Edge Gear Box, RAF Straight Trigger, Licensed 3 Gun Nation Trademark on the body, trimmed lower receiver……etc, last but not least, the body and hand guard are painted in Red. Why painted in Red, because red colored rifle is rare in the market, it is typically designed for shooting competition use, especially 3 Gun sport shooting where shooter usually dress up colorful shirt and pants with all the sponsors, brand name on it. Shooter won’t satisfy with black rifle while shooting, a red colored rifle is what the shooter always wants. It attracts audience’s eye sights all the time.